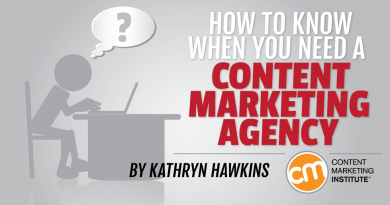 Content marketing agencies don’t try to compete with the full-service marketing agencies. They aren’t the be-everything-to-everyone resource, but they do offer unique value to a cross section of the business community that can benefit from an agency dedicated to content. You worked out your business plan, logo, website, and all that important stuff. You have seed or Series A funding, but still need to be frugal. Until you receive a more significant investment round, you’re not ready to hire a full-time marketing employee. You can pay a retainer to a content marketing agency and gain a dedicated content solution that can be customized to meet your evolving needs. Look for agencies that allow clients to modify their retainer packages at least quarterly to allow for the flexibility that a startup requires. Content marketing agencies can assist with planning your online marketing strategy. They can assist in developing written content that meets the diverse needs of a startup, including web copy, case studies, blog content, and white papers. Because your marketing strategy may evolve quickly, an agency gives you the ability to tap into a pool of talent that can be scaled to meet your company’s demand. You’ve got a solid marketing strategy, but when it comes time to execute, you don’t have staff members who have the time to produce content along with all the meetings, trade shows, and other tasks on their plates. A content marketing agency can collaborate with your internal team to create the content on your editorial calendar, including working with your CEO and subject-matter experts to create blog content and demand-generation papers on their behalf. However, as CMI’s Michele Linn points out, if you don’t have executive buy-in for your content marketing efforts, it will be difficult to tie in an outsourced provider’s work with your larger marketing strategy. To be most effective, it can be helpful to first plan a content marketing strategy and rough editorial calendar internally before you contract with an agency. In addition, a several-month trial run with an agency can help you determine how successful the effort is, and whether it may be worth investing in a full-time employee to assist with content marketing. If your marketing manager just put in her two-week notice or needs to take a three-month medical leave, your blog, and other content marketing efforts don’t need to take a hiatus. A content marketing agency can fill the gaps to sustain your content efforts. When possible, it’s important to bring in the agency while your employee is still working. While an agency’s role may be limited to content development, it is important to give the agency a clear picture of the company’s overall messaging and voice so that it can develop appropriate content to meet your goals. Many agencies are willing to step in for a set duration, which can be much more fruitful than hiring a temporary employee who is likely on the hunt for a full-time job. Many business professionals, including CEOs, consultants, doctors, attorneys, and other leaders, want to build or manage their reputations online, but don’t have the time to blog regularly. Hiring a content marketing team to ghostwrite content on your behalf and develop an influencer outreach strategy can be an ideal solution. It’s important to ensure that your content accurately supports your opinions, so you can’t put your strategy on autopilot. By collaborating with an agency to identify the key messages to share with a broader audience, you can build your reputation with minimal time investment. If the agency acts as your ghostwriter, it is important to have a non-disclosure agreement. You may not have the content expertise to complete a client project that relies heavily on long-form content because your agency focuses on ad copy and design work. In this case, subcontracting to a content marketing agency can be helpful. You can choose to brand the content as “white-label” content, which does not reveal the content marketing agency’s involvement, or identify it as outsourced work so your client can correspond directly with your subcontracted team. While white-label content may help maintain the image of a firm that can do it all, you’ll need to be careful that you don’t run into communication errors when passing feedback to the subcontracted agency or a project could easily get off track. If you run a content marketing agency or you’ve hired one for your organization, what are some other scenarios where a standalone content marketing agency might be a good choice? Share your thoughts in the comments. Want more expert insight on how to address your content marketing challenges? Check out all the fantastic CMW sessions that are available through our Video on Demand portal. Kathryn Hawkins is a principal in Eucalypt Media LLC, a Maine content marketing agency that provides consulting and creative services to corporate, educational, and non-profit clients in New England and beyond, and a freelance writer for media publications. Eucalypt Media also owns and operates Gimundo.com, a website and daily newsletter dedicated to good news and self-improvement, which averages more than 100,000 unique readers each month. Follow Kathryn on Twitter @kathrynhawkins.